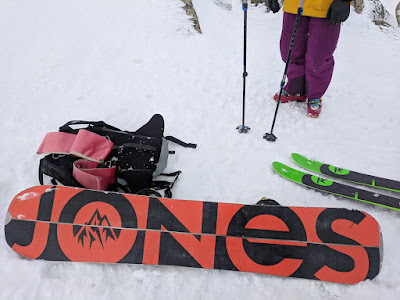 Snowboarding at a ski resort I haven’t been to before is not something I’ve done in a while, but today I got to do just that! I was at Charlotte Pass, a small ski resort out past Perisher, at the very end of Kosciuszko Rd. The only way to get there is via oversnow transport from Perisher, but thankfully my DayTripper ticket includes the return oversnow, lift access and lunch. At only $109, its great value compared to Thredbo’s single day price of $122 (lift only), and even better when it’s Charlotte Pass’ special day- only $60! 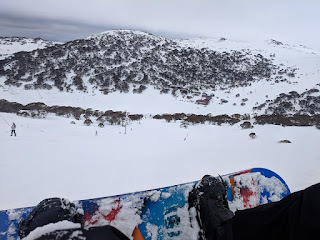 We were booked on the 8am oversnow, so it was a fairly early morning- but we got to the Perisher carpark at 7.30 and inside for check-in the required 15min before. 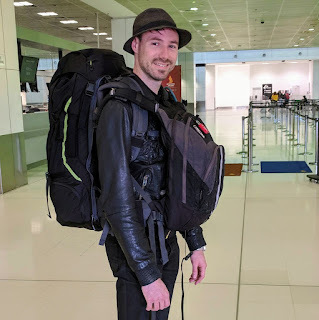 After a slight mishap of being directed to the wrong bus, we managed to get on the 8.30am oversnow and by 9am we’re entering the Charlotte Pass village. 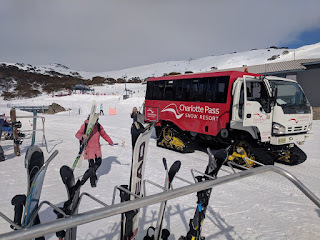 Charlotte Pass is the highest base ski resort in Australia at 1765m, compared to Thredbo village at 1365m, and the altitude difference is immediately obvious by the natural snow coverage, with little to no snowmaking. The Charlotte Pass ski area is also a fairly sheltered bowl and much less icy than you get in much of Perisher’s ski area. The first run up the Triple Chair, I immediately discover that the traverse across the ridge is thoroughly unenjoyable. It is a green run which gets you around the mountain to some other runs, but it was flat, icy and crowded. It didn’t even have the view I was expecting from such a great vantage point. Thankfully the next few runs I headed straight down the black runs to the right of the chair, The Equaliser and Sidewinder, which were not only a lot of fun to ride, but also had that view I had hoped for. I progressed to the left side of the chair and discovered 2 of my favourite things in the run called Avalanche. The first was a nice clean drop-in from a wind-blown cornice, with plenty of soft snow and an even gradient run out, and the second was an area of trees with limitless paths through them. As you can see from my Strava activity, I did this section many times and didn’t repeat the same line twice. After a bit of exploring around the Pulpit T-Bar, it was time for lunch at China King in the Lucy Lodge. The food was good, but I was eager to get back out on the slopes. Although I would have been content to continue finding new lines through the trees on Avalanche, Alan convinced me to try the opposite side of the resort area where there were more trees, but also untouched snow and a Charlotte Pass sign. So we headed to Guthries High Speed Poma, a fast rope pull lift, similar to a j-bar. 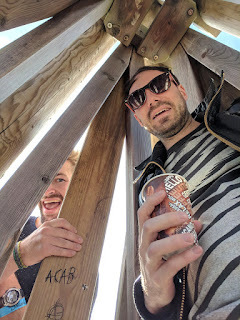 It’s got quite a kick to it when it starts and having never ridden one before there was a reasonable chance I would stack it, so naturally Alan said “You go first” and got out his phone to film me… Sorry to disappoint you Alan but I stayed on! The rest of the day is spent taking wider and wider paths through trees and rocks on Lenny’s Leap. Each time we breached another set of trees, we found another wide open area of untouched snow and soft but steep descents. We took the obligatory selfie at the Charlotte Pass sign and headed back to base for our 3.45pm return oversnow, having snowboarded 40km with over 3,300m of descent. For a relatively small area, Charlotte Pass packs a lot of punch and a variety of terrain. It might have been my first day riding Charlotte, but it certainly won’t be my last.